Protecting our member’s rights through professional and legal services insuring their wellbeing in matters that affect their work and private lives. 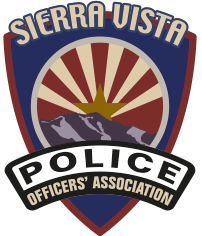 Serving the citizens of Sierra Vista by conducting activities and fostering relationships through various fundraising and charitable functions. Members of the SVPOA pay dues to maintain membership in the organization. A small portion of the dues supports the organization’s operational functions of maintaining quality of work for its members. The remainder of the dues is used within our local community to sponsor local activities and charitable functions; to include the SVPOA Charities.